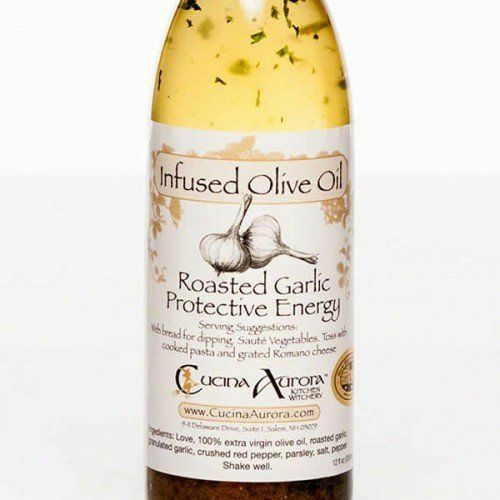 Roasted Garlic: Our best-selling oil, this 100% Italian olive oil uses granulated roasted garlic for the smoothest flavor possible, combined with just a hint of red pepper to bring out the garlic’s intensity. 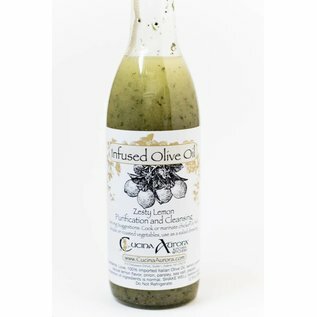 This powerful oil is perfect for bruschette, salads or just dipping with bread. Use in place of plain olive oil to sauté, fry, or grill fish, meat and veggies or simply toss and enjoy with pasta or rice. 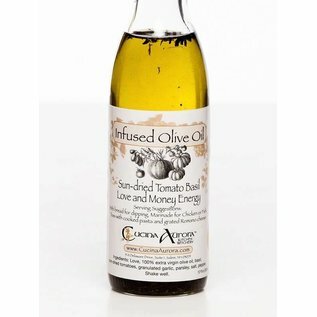 Sundried Tomato Basil: The taste of this 100% Italian olive oil is reminiscent of an al fresco dinner on a hot summer afternoon, with notes of fresh, playful pesto. Drizzle over fresh sliced tomatoes and mozzarella for an instant caprese salad. Use to marinate and sauté salmon steak, swordfish or chicken. Toss with zucchini or pasta and serve hot or cold. Makes a perfect complement to tortellini. 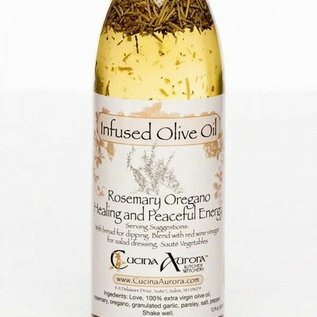 Rosemary and Oregano: This Italian olive oil combines rosemary and oregano in a subtle, light and mellow flavor that tastes like home. Combine with salads, or sautéed vegetables, or use as a spectacular starter for a chicken or vegetable soup stock. 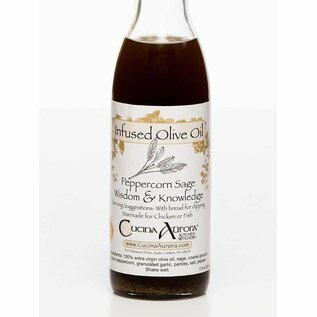 Excellent over roasted potatoes Peppercorn Sage: This 100% Italian olive oil has earned a loyal following among those with a more discerning palate. It pairs well with sausage and lentils and when used in seasonal cooking. The perfect complement to lamb and pork. Try drizzling over cooked butternut squash or use for roasting sweet potatoes and parsnips. 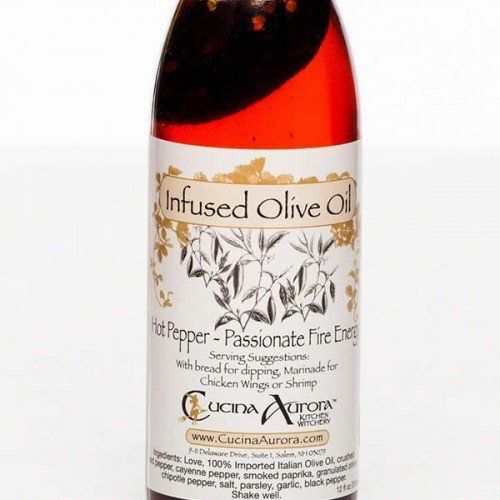 Hot Pepper: Smokey, Sweet and Spicy this Olive Oil is made with smoked paprika, cayenne pepper, and tons of passionate energy. Perfect for Dipping, Frying Chicken or Shrimp, or making hashbrowns. 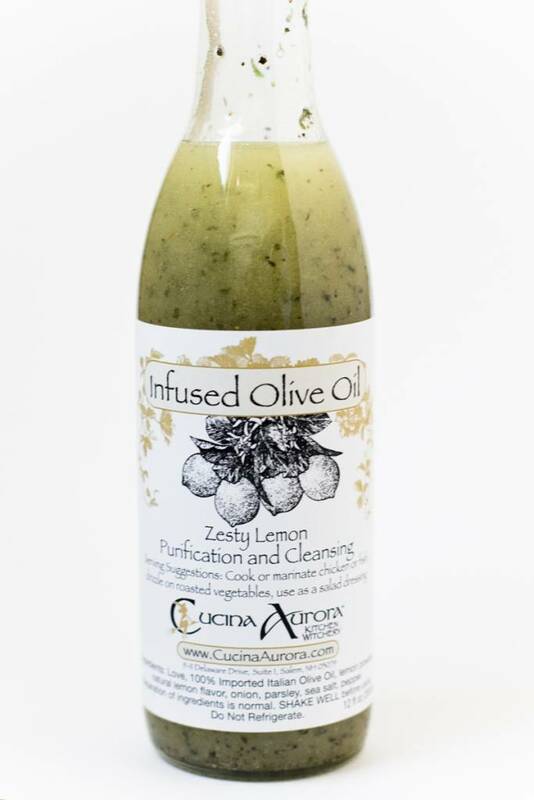 Zesty Lemon: Fresh, Bright Lemon flavor infused our NEW Zesty Lemon Olive Oil. 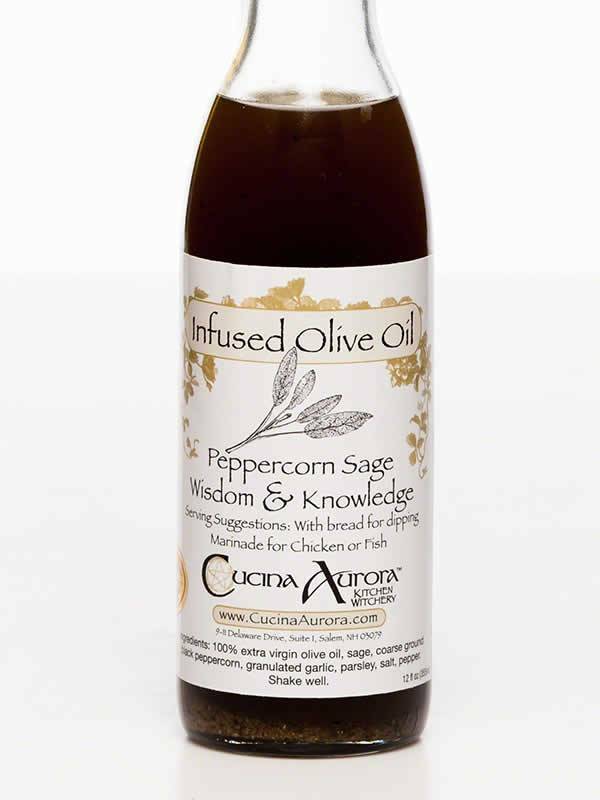 Fans of Cucina Aurora Rejoice at the flavor of our newest and most anticipated flavor. Perfect for frying Haddock or Cod, Stir frying Vegetables, Baking Lemon Chicken or Drizzling on Asparagus or Artichokes. Zesty Lemon: Brand new, just in time for Spring! Fresh, Bright Lemon flavor infused our NEW Zesty Lemon Olive Oil. 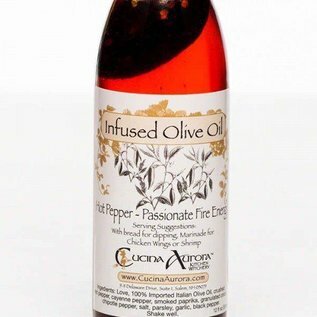 Fans of Cucina Aurora Rejoice at the flavor of our newest and most anticipated flavor. Created by Cucina Aurora Kitchen Witchery in Salem, New Hampshire. 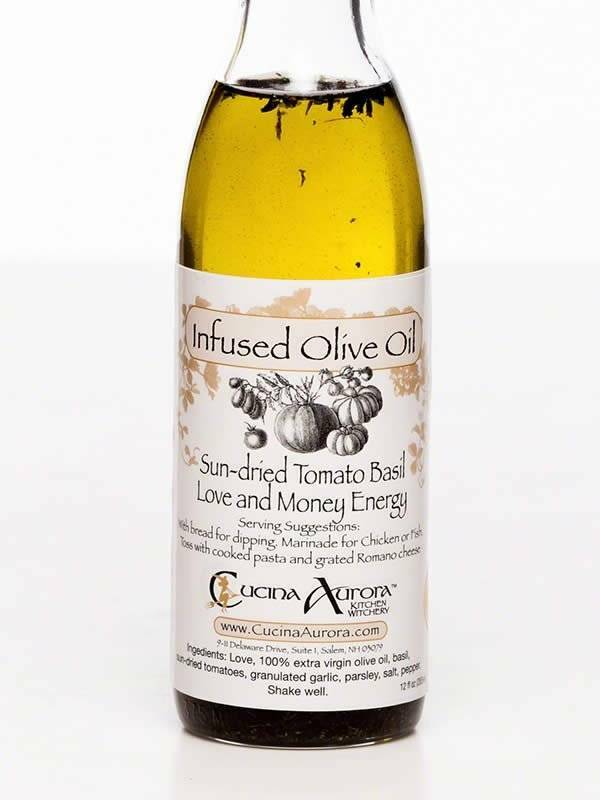 "Every wonder what makes Cucina Aurora Infused Olive Oils and other products so special? The secret is LOVE. Not only do we love what we do, but we love our customers. We consider each and every customer family. Our owner, Dawn Hunt, AKA “The Kitchen Witch” starts every recipe with love and positive intentions. It took many years for Dawn to perfect her Olive Oil infusions. She searched all over and tested many different types of oil from California, Spain and even Greece. 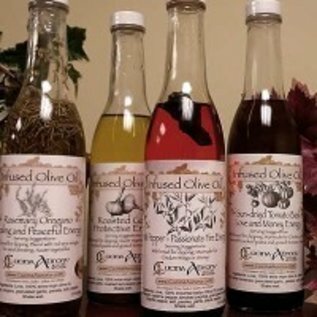 But warmth and flavor of Italian olive oil was the perfect pairing for her fresh, authentic and delicious flavor infusions. Unlike many oil infusions you may find, Cucina Aurora only uses 100% Olive Oil. 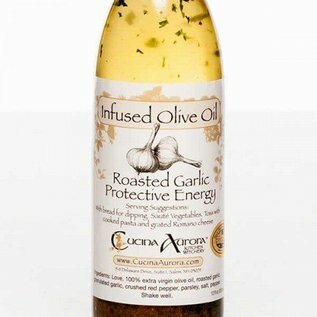 Many other brands might use a combination of Canola, or Sunflower oil, Cucina Aurora NEVER uses oil blends."